Blue Ocean Academy provides HR training Courses in Dubai and Abu Dhabi, Oman, Saudi Arabia, Qatar, Kuwait, and Bahrain. Our HR Certification Course includes CHRP and CHRM certification. At Blue Ocean Academy professionals are innovatively trained to be experts in the Human Resource Management field. CHRM is suitable for those who are already working in a managerial position in HR, leading a team of people or individual projects. 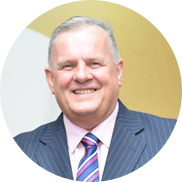 John Ellis, from the UK, is a Senior Industry Professional, NLP Life Coach and Executive Mentor. He practices with hundreds of executives every year and thousands of people have attended John’s motivational talks and seminars. He is the author of a book, ‘The 28 Golden Rules of Personal and Business Success’. John is a highly qualified & certified trainer for Human Resource Professionals and have conducted training programs across the middle east for last 25 years . John has developed a multitude of companies in various industries such as Aviation, Aerospace, Automotive, Travel, Health, Marine, Tourism, Safety and Security. He is also experienced in mergers and acquisitions, as well as advising and mentoring Company Board Executives. He delivers training courses in areas such as HR, Change Management, Negotiation, Sales and Communication Skills. John also speaks at conferences and events worldwide and appears on Sky News and BBC World News to talk about HR and industry issues. Provides the latest HR techniques for selecting and retaining Right Person on the Right job. Equips the learner with cutting edge functional strategies for handling real-life HR issues. Develops the knowledge base and provides live tools that can be used in the HR workplace. Offers environment to learn and practice skills necessary to execute organizational strategies. Upgrades the competence and awareness of HR professionals with new global best practices.